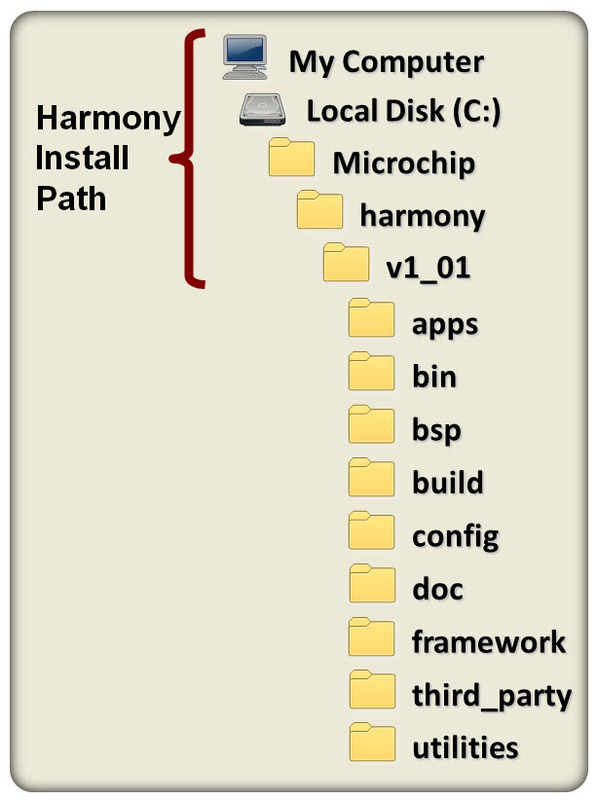 By default, MPLAB® Harmony installs into a version-specific directory. Within the installation root folder, collateral is divided into several categories by subfolders. Contains demonstration and example applications that use the MPLAB® Harmony libraries. Applications are further divided into subfolders by technology or targeted market segment. Contains pre-built binary versions of libraries, organized in a subfolder tree that mirrors the “framework” folder. Contains Board Support Packages (BSPs), organized in subfolders, each of which defines configuration values and board-specific functions for PIC32 development boards. Contains MPLAB® X build projects that can be used to rebuild the pre-built binary files for which source code is provided in the library framework folder. Contains top-level MPLAB® Harmony configuration (Hconfig) files and code generation templates (.ftl files) used by the MPLAB® Harmony Configurator (MHC) tool. Contains the MPLAB® Harmony help documentation in multiple formats (including PDF, CHM, and HTML used by the MHC tool). Contains source code for all of the MPLAB® Harmony framework libraries. Contains MPLAB® Harmony compatible offerings from third parties, including complete installations of FreeRTOS and OPENRTOS. Contains MPLAB® Harmony development and demonstration utilities, including the MPLAB Harmony Configurator (MHC) tool, the MPLAB® X Graphics Display Designer (GDDX), the Graphics Resource Converter (GRC) and TCP/IP and file system utilities. You can explore the projects, libraries, and other collateral found in these folders, but a better place to start is with the MPLAB® Harmony documentation found in the “doc” folder.